Your dog and cat need survival supplies also. Do you have a kit designed just for them? These packs for pets give them a surviving chance too. For many of us, our pets are part of our family. Heck, we often consider them almost like children, just a little furrier. With that in mind, it is important to plan for being able to take care of our pets during and after a disaster. First, make sure you have adequate supplies of food and water for each critter. Keep in mind that pets can often suffer stomach upset if their diet is significantly changed. If your dog is accustomed to eating a certain brand of kibble, that’s what you should stockpile. To do otherwise is to invite some not too pleasant side effects. If you’ve had your pets for any length of time, you should have a pretty good handle on how much they eat and drink daily. Plan to have enough food and water to last at least a couple of weeks. If your pets take any sort of medication regularly, be sure to have enough on hand to last a couple of weeks. One of my dogs takes a couple of different supplements every day. While these aren’t necessarily life-sustaining, they do wonders for his joints so we always make sure we have plenty of them on hand, just in case we’re not able to get to the store for a while. Should you end up needing to bug out, most shelters won’t allow pets. Do your homework and identify motels in easy driving distance that allow animals. The shelters that do let you bring in dogs and cats will require them to be leashed if not kenneled and will also need to see proof of immunizations. Do everyone a favor and make a copy of the immunization record for each pet and keep it in a envelope taped to the kennel. Put together a small bug out kit for each pet, too. Inside, it should have enough food for a day or two in a sealed container, a folding water bowl, extra leash and muzzle, and a chew toy or other distraction. 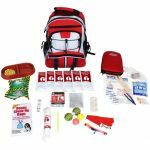 All of this could be kept with your own bug out bag. If the pet will likely be walking on a leash during travel, consider investing in a set of boots for them. After a disaster, there is likely to be debris scattered around, including broken glass. If you buy this sort of foot protection, take the time now to train the animal so they are used to wearing it. A critical element, one that is often forgotten, is to have with you a current picture of you with your pet. Collars and tags can become loose or lost. That picture might be the single best way to prove the animal is yours. In the event the animal goes missing, you can distribute that picture to searchers. Our pets rely upon us for food, water, and shelter. While most pets still retain at least some degree of instinct, the vast majority of them simply won’t last very long if left to fend for themselves. Do the right thing and prepare to meet their needs during and after a disaster.